Simple and elegant, this loveseat helps to bring a tranquil feel to any outdoor patio. The piece features a powder-coated aluminum frame for durability, with synthetic wicker weaving for a touch of tropical style. Plush seat and back cushions complete the loveseat to guarantee comfort as you relax with family and friends. Put this end table next to your outdoor sofa for a tropical accent perfect for setting down your drink. The coated aluminum frame with synthetic wicker weaving is durable and stylish, while the glass top provides an elegant touch. 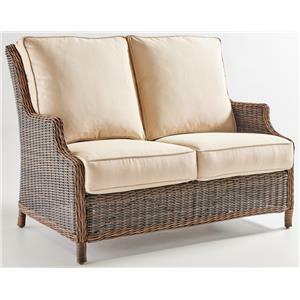 Enjoy your outdoor space with a partner with this outdoor wicker loveseat. The synthetic chestnut wicker is handwoven over an aluminum frame to ensure construction that will stand the test of time. Shapely arms and a winged back design provide a touch of traditional detail that you'll love having in your outdoor entertainment space. 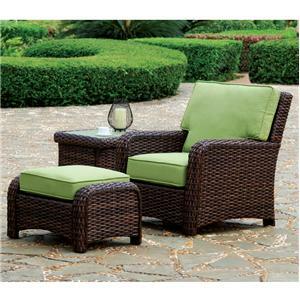 Enjoy a beautiful day out on your patio with this chestnut wicker conversation set. Consisting of a chair and ottoman, loveseat, sofa, end table, and coffee table, you'll be able to entertain many of your friends and family. 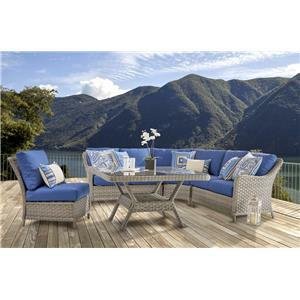 With this outdoor chat set, you have all the pieces for a fabulous time on your patio. Generous seating and the dining chat table will allow you to talk, eat, and forge lasting memories with friends and family. 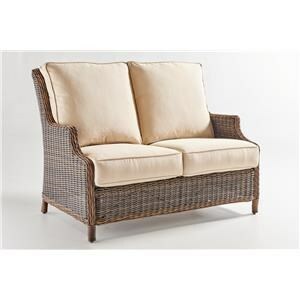 Create a casual outdoor lounge area with this all-weather wicker arm chair. 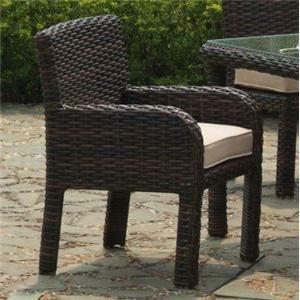 The wicker frame has curved arms and clean modern lines. Plush cushions offer a comfortable spot to sit and relax with family and friends. 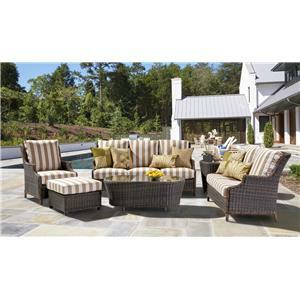 This plush outdoor ottoman is the perfect complement for your outdoor seating area. 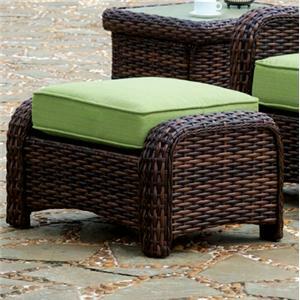 Sit back and relax, and enjoy lounging on your deck or patio with this modern wicker ottoman. Pull this arm chair up at your outdoor dining table. The clean modern look of this wicker chair will help you creating a relaxing outdoor entertaining space. A comfortable seat cushion ensures that friends will linger. 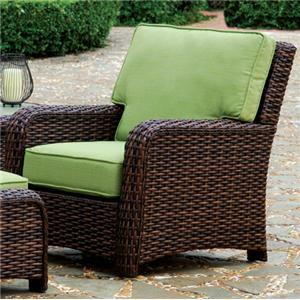 Compliment your casual outdoor lounge area with this all-weather wicker arm chair and ottoman set. 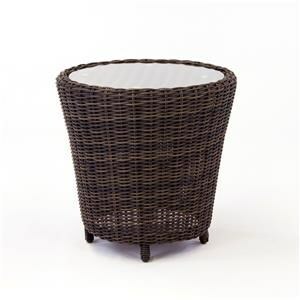 The wicker frame has curved arms and clean modern lines. Plush cushions offer a comfortable spot to sit and relax with family and friends. 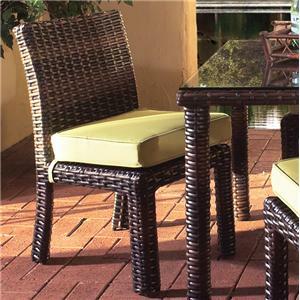 This contemporary wicker outdoor dining side chair offers a comfy seat to enjoy al fresco dining. The chair has clean simple lines, with a welted seat cushion. Make the most of your patio, and enjoy dinner outdoors.